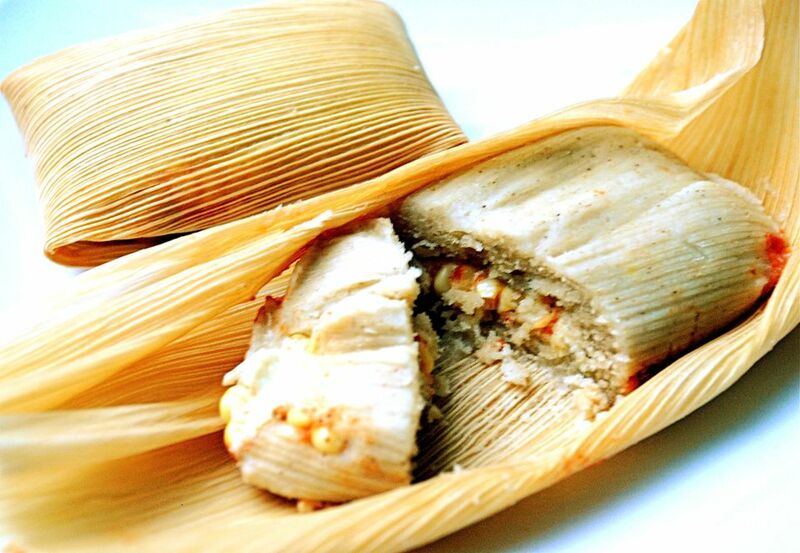 Traditional tamales are made with a corn masa dough surrounding a meat filling. Humitas are another kind of tamale made with fresh ground corn instead of masa. These garden vegetable tamales have the traditional masa dough, but the vegetarian filling is made with fresh corn, tomatoes, green onions, cilantro, and cheese. The smoky corn flavor of the masa dough contrasts nicely with the sweet fresh corn filling. Once you learn the basics of tamale making, you can fill them with anything from stewed or pulled meats and or other vegetables. Place the cornhusks in a large pot and completely cover them with hot water. Soak the cornhusks for 30 minutes to an hour until they soften and are pliable. In a medium bowl, mix the cornmeal with a pinch of salt and 1 1/2 cups of vegetable stock. Add the vegetable shortening and work the fat into the mixture with your fingers. Add more vegetable stock in small amounts, kneading after each addition, until you have a smooth, soft dough. The dough should be moist and a little sticky, not stiff. Add the vegetable oil to a heavy skillet and saute the tomatoes, green onions, cumin and sugar over medium heat. Cook until most of the water is evaporated and the vegetables are soft and fragrant, taking about 10 minutes. Cut corn kernels off the ears of corn and stir into the vegetable mixture. Saute 2 more minutes, seasoning with salt and pepper to taste. Remove from heat and stir in cilantro leaves and the aji amarillo paste, if desired. Drain the corn husks and spread them out flat. Place about 3 tablespoons of masa harina dough in the middle of each corn husk. Use your fingers to press the dough into a 2- by 3 1/2-inch rectangle. Top the dough with 1 1/2 tablespoons of the corn and tomato mixture and a few crumbles of the queso fresco. Place another 2 tablespoons of masa dough on top. Fold the sides of the cornhusks in over the filling, then turn the pointed ends up to the middle, then fold the top flap down, making a little package (for the best outcome make sure you know the proper way to wrap a tamale). Tie the tamales with a strand of cornhusk or twine to secure the husks around the filling. To make larger tamales, you can overlap 2 cornhusks and use them together to wrap the tamale. Bring 1 to 2 inches of water to boil in a steamer pot or a large pot with a colander or steaming basket set into it. Fill the colander or basket with one layer of tamales; you might have to steam them in batches. The tamales should be above the water line. They are cooked only by the steam. Cover the tamales with a dish towel and the pot lid and steam them for 30 to 40 minutes; add water to the pot when necessary. Tamales can be reheated in the microwave. They can also be frozen; reheat them by steaming them for 15 to 20 minutes or by heating them in the oven, wrapped in foil, for about the same amount of time.